How many cloud apps does it take to run your business? 2? 10? 75? Lost track, already? NetSkope published a report in Sept 2016 that states - “Average cloud apps per enterprise increased to 977 worldwide this quarter”. This means that we are shifting from one app notification to another, from one email to another, from one tab to another, bordering on a digital ADHD. And for your SaaS, this also means losing track of your customer’s subscription notifications. Suddenly you find your productivity taking a hit. You wished you could organize, communicate and collaborate with your team, your customers, your partners - EASILY and ALL IN ONE PLACE. 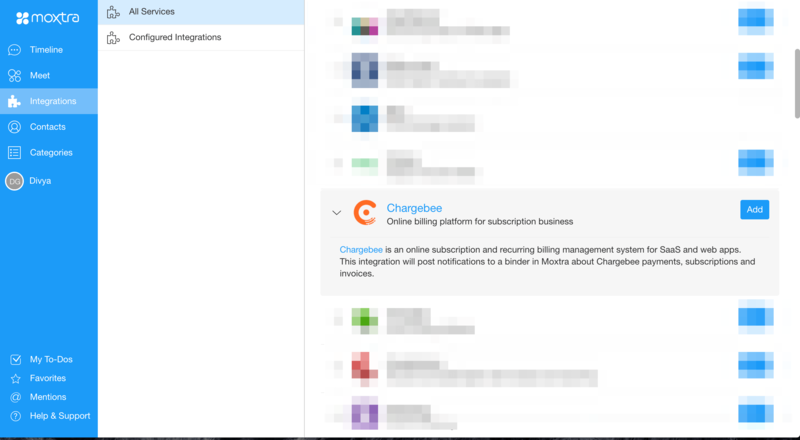 Moxtra, a cloud collaboration service, integrated with Chargebee, so you can stay up to date with events that take place in Chargebee and create the notifications as actionables in your Moxtra binder. 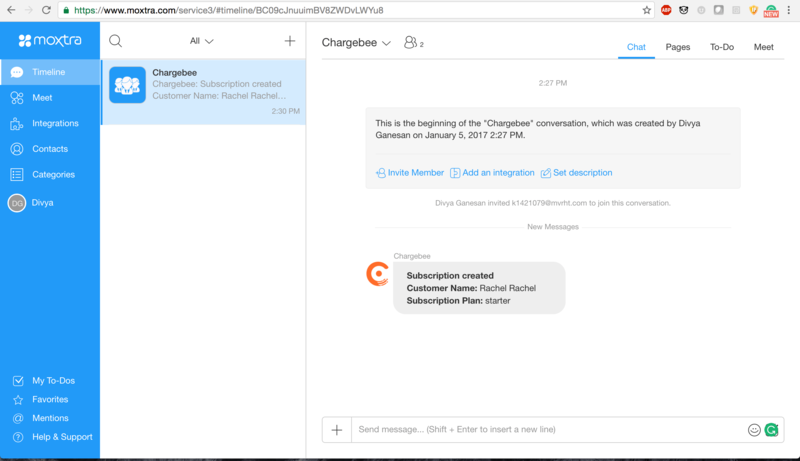 With this collaboration, merchants can receive notifications of any actions or events that take place in their Chargebee account. Communication within your team and with your customers is possible through chats, document sharing, to-do lists, and meetings. 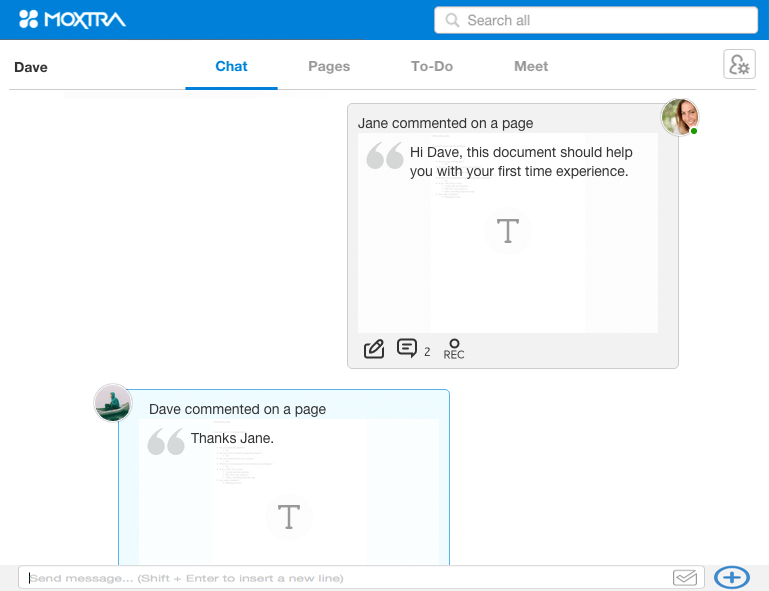 Moxtra is the collaboration companion that works the way teams do: flexibly and simply, in real-time or anytime. Go from notification to solution within minutes. Notify your team about all billing and subscription related events directly using a Moxtra binder, to send messages, annotate and sign documents, jump into a meeting and allow screen-sharing to and from any device. Track new subscriptions using this integration. As soon as a customer subscribes, a notification is sent to the team’s workspace and the entire customer support team becomes aware of this event. Anyone from this team can be assigned to help onboard this customer and collect initial feedback. This feedback can then be routed to the team so everyone is up to date. Smoothen the process of customer onboarding and follow-up.The interaction with the customer about their onboarding can happen using the Moxtra power messenger, or through a Moxtra Meet. Visit Moxtra to learn more about setting up this integration.